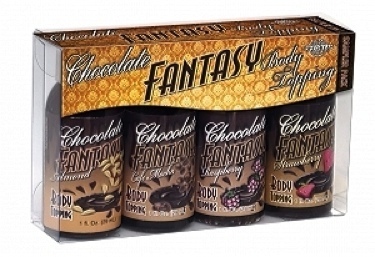 Chocolate Fantasy Sampler Pack PD973508. Fudgy fun for lovers. 4 1 ounce plastic bottles. Travel size. Indulge yourself and your lover into chocolate bliss. These pillow packs of fudgy fun for lovers is a tasty way to foreplay. Bon Appetit! Assortment flavors Chocolate Strawberry, Chocolate Raspberry, Chocolate Almond, Cafe Mocha. Use care when using Cafe Mocha may stain fabric. Edible. Certain individuals with sensitivities contain nut products. Featured in Pipedream Products	2008 Catalog A New Dimension in Pleasure, page 30.